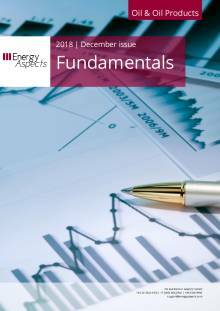 Fundamentals is our monthly review of global oil data, this is the November edition. The main changes to our 2018 and 2019 balances this month relate to the Iran waivers and higher US production. Compared to last month, when we expected 0.9 mb/d of Q4 18 stockdraws, we now expect draws of 0.6 mb/d. Across 2019, Q1 19 stockbuilds are higher at 0.4 mb/d while 2019 stocks are expected to be flat. Of course, all of this may change if OPEC decides to curtail production in 2019 to the tune of 1 to 1.5 mb/d, but for now, we are not adjusting our OPEC balances for next year. The biggest change to our Q4 18 OPEC estimates comes from the announcement of the Iranian waivers, with the rest of the changes to OPEC and non-OPEC ex-US figures marginal. We have noted several times that Russian and UAE production will likely come in around 0.15 mb/d higher than our initial forecast for Q4 18 based on October production, but increases from Saudi Arabia, Iraq and Kuwait have come in exactly in line, if not slightly below in the case of the Kingdom. However, following the Iran waivers, we have had to increase our estimate for Iranian production based on 1.3 mb/d of exports in December. Q4 18 Iranian crude, condensate and NGLs production is now pegged 0.3 mb/d higher at 3.3 mb/d (with crude at 2.6 mb/d) versus our previous estimates—this also includes Iran being able to store 30 mb of crude in China in bonded tanks, which allows them to delay the cutback in production. Details about the volumes involved in the US sanctions waivers are still missing, weeks after the announcement. While this opacity seems intentional—the US administration is trying to maximise its room to manoeuvre and reconcile its contradictory aims of pressuring Tehran and keeping oil prices down—its ambiguity is likely to undermine the credibility of its own Iran policy. This carries with it the risk that exports may come in higher than 1.3 mb/d, although payment and insurance difficulties may keep the volume of cheating limited. Outside of Iran, the primary supply centre that has surprised to the upside in our balances is the US. This is based on a surge in output over July and particularly August, when crude output surpassed every expectation on the Street and rose by 0.3 mb/d m/m, which we have extrapolated forward. As a result, we have revised our 2018 non-OPEC supply number upward by 0.23 mb/d, with 0.22 mb/d of the revision coming from the US. The scale of growth in August remains suspect given a large part of the increase came from ‘other’ non-key basins, but there is little doubt that, having grown in line with expectations through H1 18, Q3 18 US production surged over and above even the most bullish expectations in the market. We expect q/q growth in total liquids to slow (led by NGLs) in Q4 18, but there will still be some growth according to our balances, and y/y growth will still be incredibly strong at over 2 mb/d. This, together with higher Iranian production estimates, reduces our Q4 18 stockdraws by 0.3 mb/d to 0.6 mb/d. Add on the refinery delays in Asia, and Q4 18 is no longer going to be the tightest quarter for crude balances in a decade—even though, on a monthly basis, November will be as Iranian exports should plummet this month. For 2019, the changes are minor and mainly concern carrying the higher US production baseline forward. However, there are increasing demand fears leading to widespread end-user destocking in Asia, which is now showing up in weaker petrochemical margins. The Chinese government, for instance, remains cautious about the likelihood of a trade breakthrough with the US. With growth in retail sales, manufacturing and property investment slowing, this is impacting confidence, which can, in turn, slow investment further and pull demand growth down next year. While we are cautious at 1.3 mb/d of y/y growth in demand next year—and the cold weather so far does suggest we may keep winter demand high over Q1 19 as well, as long as the cold persists—there are increasingly downside risks to our demand figures for next year. Fundamentals is our monthly review of global oil data, this is the March 2019 edition.Our Q1 19 c.. Fundamentals is our monthly review of global oil data, this is the February 2019 edition.Our Q4 1..
Our Q4 18 balances have significantly changed from last month and now show liquids builds of 0.4.. 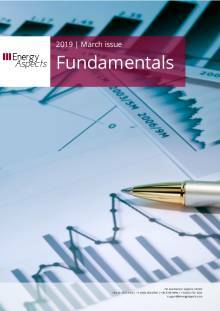 Fundamentals is our monthly review of global oil data, this is the December edition. Happy holida..